Toshiba believes sales of large-size LCD TVs will experience huge growth this year, with 60-inch and above displays really coming into their own in 2010. Before formally announcing Tosh's impressive Cell TV line, Scott Ramirez, Head of Marketing for Toshiba's US TV group, said we'll see a 25 per cent growth in big-screen sales over the next year. Ramirez said the next 12 months will see 27 per cent unit sales growth in LCD TVs – with a projected 34 million sets to be sold during 2010. In contrast, 3.4 million plasma sets will be sold. Toshiba is targeting sales of 15 million sets worldwide during 2010, with 4 million for Europe. Ramirez did add that revenue was down slightly in the LCD market but that the figures don't result from a race to the bottom. "People will pay for extra value. It's how they buy quality that's changed – it has to fit their needs. And we need to create the products that meet their needs." Speaking in a separate briefing with TechRadar and other European journalists, Masaaki Osumi, President of Toshiba's Digital Media Network Company added there would also be a rapid shift to LED backlit displays to 21 per cent of LCD sales in 2010, rising to 36 per cent in 2012. In Japan, the Cell Regza sold over 1,000 units in December said Osumi. Alan Thomspson, President of Toshiba in Europe talked about how Toshiba adapted its strategy. "In the past we've always talked about the three screen strategy, but the number of screens is multiplying. There are many variations on a theme, and we need to make sure we can [deal with] those." "[The Cell TV] is just the beginning of a revolution putting the TV at the centre." Ramirez believes the changing market provides openings for Toshiba. "Streaming and downloading moving up – it's happening. This creates some opportunity." 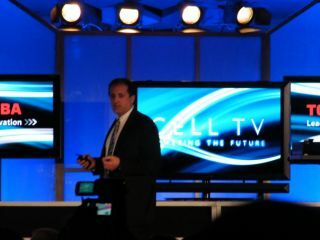 The new Cell TV incorporates tech to improve the picture quality of downloads. "Consumers are getting more connected but so far there's no complete solution. Yes, the applications are around. Are they simple, are they unified? Not necessarily." "There are consumer needs to fill, we have the technology to fill them."